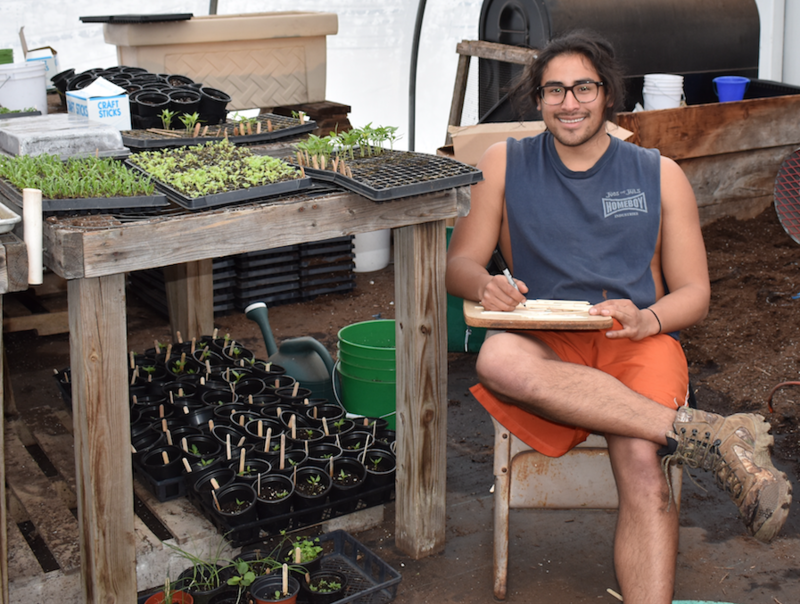 On a cold April day, Matt Lovecchio tends to seedlings in the warmth of City Farm’s greenhouse. He first came to SCLT in 2016 as a Providence College intern and has continued as a volunteer here ever since. In that time he’s also changed his major, managed a community garden in Providence and mentored youth in Smith Hill. Now about to graduate, he was hired as the Assistant Steward at City Farm, where he’ll not only help to manage the operation but train this year’s PC intern and many other college students, youth staff and volunteers who will work at the Farm throughout the season. SCLT has a long history of partnering with area colleges and universities, training students in sustainable agriculture and food systems work while exposing them to issues of food access and health inequity. Our work with immigrant populations also offers rich possibilities for academic research. 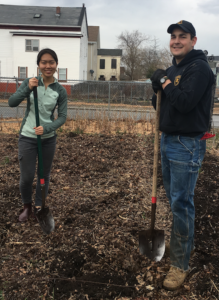 While not every student who interns at SCLT wants to be an urban farmer, their sweat equity and experience in what City Farm Steward Rich Pederson calls direct ecology are formative. In return, SCLT has a reliable stream of young people who help the Farm to flourish as a production and demonstration farm with a vital connection to the greater community. Former Providence College intern and current Assistant City Farm Steward Matt Lovecchio in the greenhouse. When Rich came to SCLT in 2001, there was a lot of work to do at the Farm and not enough help. At the same time, local students were interested in working hard in return for learning how to grow food. He recalls taking on students from PC, Brown, RISD, Wheaton, Johnson & Wales, CCRI, RIC, URI, Bryant and others over the years. The PC internship is coordinated by Keith Morton, a professor in PC’s Public and Community Service Studies and American Studies departments, and former SCLT board member. The internship began as a semester-long program in 1995, but Rich and Keith convinced higher ups at PC that it should run the length of the growing season and include a full-time position during the summer. For the past five years the PC intern has become fully immersed in the Farm and gains a full understanding of urban agriculture from seed to harvest. SCLT also has a long history of working with Brown University. Recently we reconnected with the Swearer Center, which has provided fellows to our staff in the past two years. Dawn King, a professor in Environmental Studies, has brought students to learn about and spend time at City Farm soon after coming to Brown six years ago. 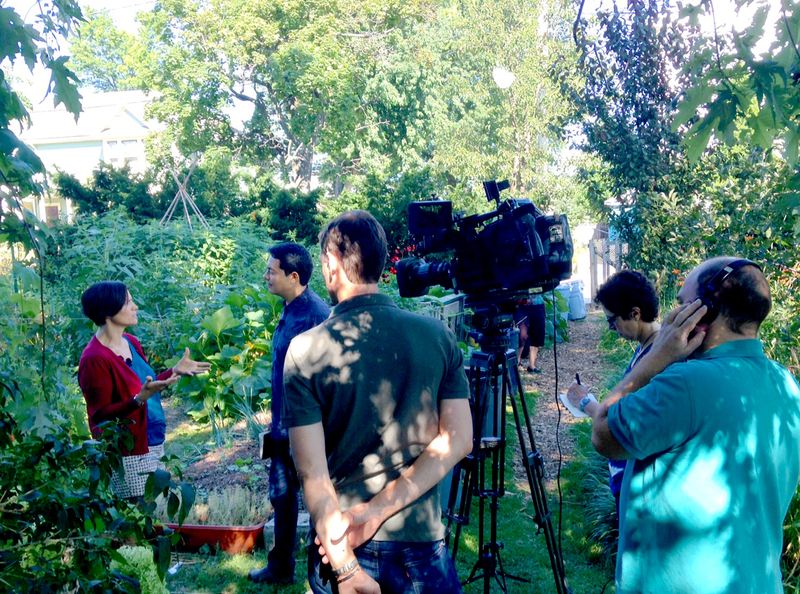 With expertise in local food policy and politics, she teaches a popular course, “Urban Agriculture: The Importance of Localized Food Systems,” which is categorized as an Engaged Scholarship course at Brown. The Program enables students in participating majors to integrate their academics with community engagement, designing their concentration curriculum around designated Engaged Scholarship courses and combining this coursework with outside practicum and capstone projects. Although the Program is still relatively new in its third year, King’s courses have been well ahead of the curve in terms of community engagement being incorporated into the curriculum. “Environmental studies students in general tend to be a little more hands-on,” Dawn says. “They like to get their hands dirty and get off College Hill.” Having an engaged component allows them to get a practical education that includes learning about not only urban agriculture but also how to navigate a relationship with a community partner. Many of Dawn’s students are inspired by their experiences and want to do more. “Ideally, students graduate and feel empowered to be part of that next community as well,” she says. URI also has a symbiotic relationship with SCLT. John Taylor, a professor of Plant Sciences and Entomology, is currently conducting a longitudinal study about the impacts of developing a community garden on populations at Galego Community Farm in Pawtucket. He collaborates with faculty in URI’s College of Health Sciences to explore the garden’s effect on social networks as well as the dietary habits of both gardeners and neighboring residents. Engaged scholars Ruitian Yan and Joel Fudge prepare beds after the long winter at City Farm as part of their Urban Agriculture class at Brown University. John began his research when the Galego property was renovated over a year ago, and says that being there from the start allows him to see the immediate as well as long-term impact of the Farm’s development. He has surveyed people about their garden histories and practices, and inventoried their plots to see what they’re growing and its impact on soil quality, organic matter and even bee diversity. He’s about to start collecting data for the second year of his study. URI students get involved as both undergraduate and graduate research assistants. Rebecca Vazquez, a bi-lingual undergraduate research assistant, has interviewed Pawtucket residents and collected data about bees at Galego. URI’s Marta Gomez-Chiarri is now coordinating a new interdisciplinary major in sustainable agriculture and food systems that launched at URI in 2016. She is hoping that SCLT youth staff from Providence will enroll in the program after high school. The cross pollinating that goes on among SCLT and area colleges and universities is extensive, and no doubt spreads beyond Rhode Island. Matt Lovecchio’s internship at City Farm inspired him to want to pursue the ideals of sustainable agriculture, social justice, environmental stewardship and community building. Looking ahead, he sees agriculture as a means for travel post graduation.